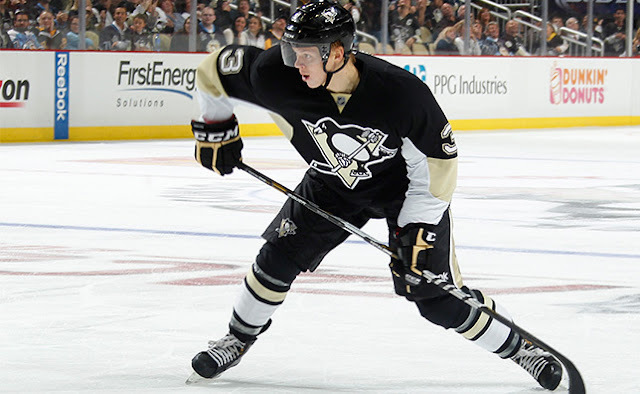 There was never a question that the Pittsburgh Penguins were going to re-sign Olli Maatta. Maatta was scheduled to be a restricted free agent coming off a very successful entry level contract, and the Pens would have had full control over keeping him in Pittsburgh. The biggest question GM Jim Rutherford faced was what type of term to give the young defenseman, and how high he was willing to go on his cap hit. Should he sign Maatta to a bridge deal at a lower AAV to maximize the team's cap space in the next couple of seasons, trading off likely paying Maatta more later down the road to allow for more cap flexibility before Crosby and Malkin both enter their 30s? Or should he try to lock up Maatta to a long term deal at at price that becomes a steal if Maatta continues to develop? Rutherford chose the later in signing Maatta to a 6 year, $24.5 million extension that will carry a cap hit of $4.083 million starting next year. It's a home run for the team as well as a fair deal for Maatta as well. Maatta gets financial stability with the deal, and doesn't have to worry about another potential injury that could threaten to derail his playing career and earning potential like his shoulder injury did last season. Furthermore, it sets up Maatta perfectly at the end of the contract as he'll be a 27-year-old unrestricted free agent with a prime opportunity to really cash in on his third contract. As for the Penguins, the deal allows them to lock up another key piece long term for a below market price. If Rutherford had opted to sign Maatta to a bridge deal, it's likely that he'd have been looking around $3 million AAV anyways. By paying a fraction more, he's able to buy 2 years of Maatta's UFA status, which is invaluable to teams with young, talented RFAs and typically comes at a higher premium than Rutherford was forced to pay here. Maatta has had a solid and somewhat inconsistent season after missing all but 20 games last year with the shoulder injuries and surgery to remove a cancerous tumor. He has 6 goals and 10 assists in 53 games, and for a player that has been a solid driver of possession at such a young age he's struggled in that area this season, posting a negative relative CF% for the first time in his career. Even still, it's a low risk, high reward deal for the Penguins. If Maatta were to remain at his current level of play over the course of the deal, it wouldn't be much of an overpayment, and even in the worst case sceneario it would probably still be a fairly movable contract. That being said, there's certainly no one with the team that doesn't expect Maatta to keep improving as he reaches his prime, and that scenario is far from the most likely outcome. But in an era where 2nd pairing defensemen are cashing in for $5 million+ AAVs in free agency it has a high potential of becoming a steal. If Maatta can continue developing into a top pair caliber player, the roughly $4 million cap hit will be an absolute bargain in the later years of the deal. It's good for the player, great for the team, and most importantly keeps a key young piece in Pittsburgh for the foreseeable future.